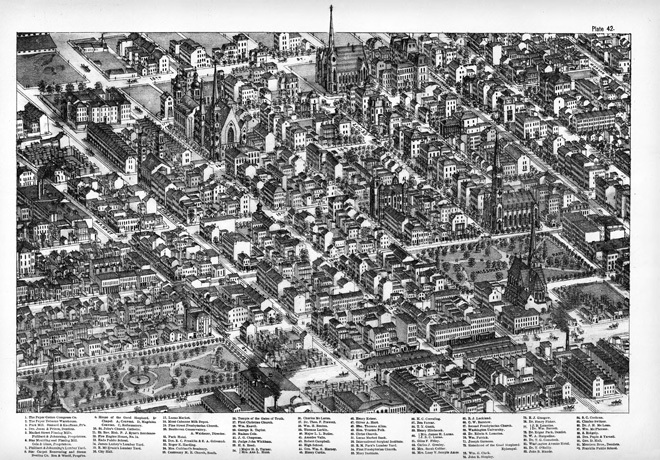 The level of detail in Compton & Dry’s 1875 Pictorial St. Louis map is extraordinary… but where’s the color? Well, that map is still driving me crazy. Compton and Dry’s 1875 Pictorial St. Louis, the same map that led me on an exhaustive brewery hunt earlier this summer, has completely derailed my summer plans once again. I can’t say that’s actually a bad thing, but it does mean that a dozen or more potential Distilled History ideas have to take a back seat once again. For a history nerd who dreamed of being a cartographer as a kid (seriously), this map infatuation of mine explains why Compton and Dry’s opus is easily my favorite item or “thing” in St. Louis history. I think about it every single day, a result of its use as my iPhone wallpaper and its prominent placement on my living room wall. It is also the most referenced source material in just about every history-related project I undertake. And what gets me in trouble is that each time I look at it, I can’t help but think up new ideas in which to have fun with it. Looking back on that moment now, I probably should have taken a moment to think about what I had in mind. Hand coloring the Compton and Dry map, all 110 plates of it, is a monumental task for a throng of artists, let alone an individual non-artist. But before I had an idea of what I had taken on, a cocktail was poured, Photoshop was open, and a gigantic map beckoned. That’s when the real delusions of grandeur began. In only fifteen minutes,I had the finishing touches applied to a single building, a brick brewery drawn on Compton & Dry’s Plate 27. A post on social media followed, and the horde of “likes” that flooded in had me instantly convinced that I was about to strike St. Louis history gold. I even convinced myself that I could finish the project in a year, maybe two. So I dove in further, determined to soon have the 110 plates of Compton & Dry’s map in full-color glory for all to see. Before I get to the what happened next, I want to mention that I’m well aware that I’m not the first person to “colorize” Compton and Dry’s map. I’ve seen other attempts, most notably an unknown artist who took a crack at Plate 42 with watercolors many years ago. I think it looks fantastic, but many of the buildings, homes, and roofs are painted with just a few different shades of brown and gray. I’ve also never seen examples of the technique applied to any of the other plates. I wanted to try adding color to the map (in intricate detail) using a full spectrum of color. Fast-forward about eight weeks and here I am. After countless hours of zooming, coloring, erasing, shading, and tweaking, is my plan to color the Compton and Dry’s map in two years possible? The answer is simple: Absolutely not. However, I’m happy to say that I have completely finished one of the 110 plates to my satisfaction. And I am really happy with how it looks. I’m sure I missed a pixel or two, but I really did my best to make sure every single building, house, tree, sidewalk, fencepost, and blade of grass had color. I added stained glass to church windows, added sunlight to trees, and used at least thirty different shades of brick. When possible, I even tried to accurately match a few structures to the colors they wore in 1875. But at times, it became an overwhelmingly daunting task. The first plate I chose to color contained so many trees, so many chimneys, and so many roofs. Looking back, it was the roofs the stopped me after one plate. Roofs are boring to color. But in the end, I do think it was a fun project to work on. It gave me something to (mindlessly) do as I watched a ballgame, filled in crossword puzzles, and sipped cocktails. I’ll also say that coloring is very relaxing. It’s made me realize that I few cranky people I know could use a box of crayons. Like my watercolor friend of the past, I chose to begin with Plate 42. It’s where my beloved Campbell House is drawn, and my office (the “real job” office) sits in a building at the northwest corner of 18th and Washington in a building constructed after the map was drawn. But Plate 42 is also crammed with tons of great history. I can’t even begin to do it justice here, but plate 42 shows us Washington University at its original location (southwest corner of 18th and Washington), the future site of City Hall (Washington Park), and the future site of the magnificent Central Library (Missouri Park). Just behind the Campbell House, the city’s first public high school (known simply as “High School” in 1875) can be seen at the corner of Olive and 15th. Finally, two long structures known as the Lucas Market can be seen running right down the middle of Twelfth Street. That market is gone today, but it serves as a reminder why Twelfth Street (now called Tucker Boulevard in that part of the city) is one of the widest streets in downtown St. Louis. Most significantly, plate 42 is where the Lucas Place neighborhood appears on Compton and Dry’s map. The height of residential luxury in 1875 St. Louis, Lucas Place can rightly be called St. Louis’s first suburb, an inescapable aspect of the city today. Planned and developed by a man named John H. Lucas in the 1840’s, it was the first neighborhood to be deliberately built at a distance from the city’s congested riverfront. Lucas Place was at its apex when Compton and Dry drew it on their map in 1875. Along with the Campbell family, Lucas Place was home to many wealthy and prominent figures in 19th Century St. Louis. The list includes William S. Harney, one of the longest-serving Generals in American history, Henry Hitchcock, a co-founder of the American Bar Association and the first dean of the Washington University’s Law School, and Trusten Polk, a former Governor of Missouri and former United States Senator. What’s depressing about plate 42 today is how much of it has been erased. Of the hundreds of homes, schools, churches, and buildings drawn on plate 42, only four structures remain today. Along with the Campbell House, only three churches drawn on Plate 42 still stand today: Christ Church Cathedral, Centenary Methodist Church, and St. John the Apostle Catholic Church. It’s a blunt reminder that St. Louis has literally wiped much of its history right off the map. Finally, I wanted to mention something I couldn’t stop (humorously) thinking about the more I stared at the map. After spending countless hours looking at it, it became impossible not to notice how absurdly neat and tidy St. Louis looks in Compton and Dry’s version of it. 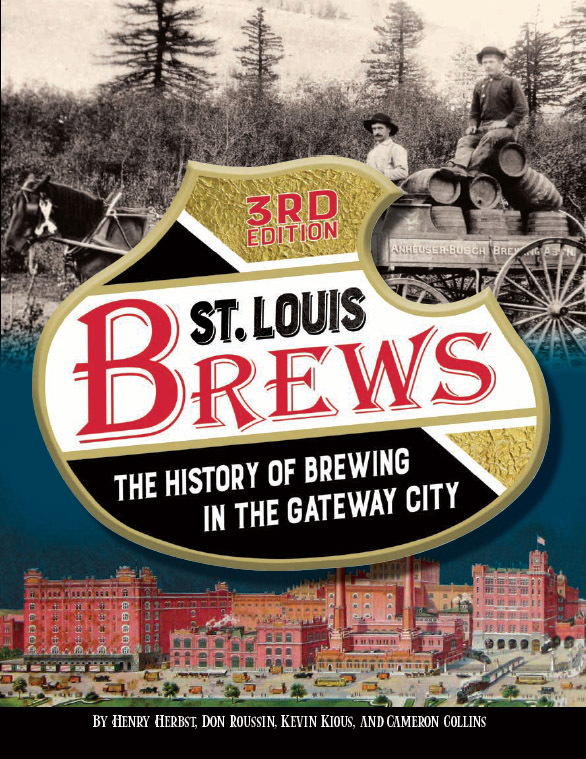 I didn’t find myself coloring in piles of animal manure, drunken men stumbling out of saloons, or puddles of fetid water, all of which St. Louis had plenty of in 1875. I also looks nearly void of people, with only a few loitering on random corners. I know Compton and Dry drew their map to make St. Louis look pretty, but it would have been fun to color in a bank robbery or maybe some roaming livestock. Despite my determination to get Plate 42 fully colored, I’m done with Compton and Dry for a while. My dreams of having a full-color version of the map by 2017 have been laughed off long ago. However, I’m sure I’ll pick up the pen again before too long. think I’ve kicked off a fun hobby I’ll have for years to come, and I’m sure I’ll use a bit of color here and there to support future blog posts. But enough with all that. Let’s get to the color. Image Loupe – Drag the mouse pointer to zoom in parts of the final image. Follow this blog, and you’ll know that each post ends with a drink that relates directly to the subject matter of the post. But Plate 42 doesn’t offer many drink options since the dozens of saloons that once dotted it are all long gone. But the Campbell House, one of four still standing tall from Plate 42, has given me an opportunity to not only get a drink, but to give a few away. On Friday, September 25, Distilled History is teaming up with the Campbell House Museum for our annual #DrinkupTweetupSTL event. I blogged about last year’s event, and we have even more fun lined up for this year. Typhoon Jackson will be back to provide live music, free beer will be provided by Schlafly and Urban Chestnut, and free food will be provided by Caruso’s Deli. The house will be open to take a look at, and I’ll have a bunch of fun Victoria-era drinking history on hand. We’ll also be raffling off a bunch of great prizes, including a brewing history tour (led by me) and our annual grand prize, a chance to do a shot of whiskey out of a silver cup once owned by President Ulysses S. Grant. I’ve even got a few additional perks. First of all, I’ll have a 4×5 foot enlargement of Plate 42 in full color on display for everyone to take a closer look at. I’ll also be passing out samples of my “Campbell Beer Series” and my own version of bathtub gin. This year also marks the debut of “Gus and Mary’s Answer the Bell Ale”, a new addition to the Campbell beer family honoring the many servants that worked and lived in the home during its eighty-four year run. Please consider joining us! You know, they make adult coloring books these days. You ought to find some interested parties, send them a few plates, give them a limited set of colors, and have them color them and send them back. Love your treatment of the plate and another great article. This is really cool, Cameron! Hopefully you continue to use the old city as a coloring book (as a hobby, of course) and fill in more of these over the years. Really makes the plates — and the City — seem more alive/interesting! Those Before/After and Image Loupe plugins are great — especially for the C&D images, since simply Ctrl+Shift+Up doesn’t really maintain clarity. Thanks! It got tedious at times, but it was a fun project. I have started on another plate and I recently put an early pic of it up the DH Facebook page. I’m going with Plate 39 this time (with Lafayette Square) and it should go much quicker since the area didn’t have as many homes/structures then. I plan to keep coloring, but several of the downtown areas are going to be just brutal. A few years ago, l georeferenced the Compton Pictorial St. Louis maps and put them into a online map. 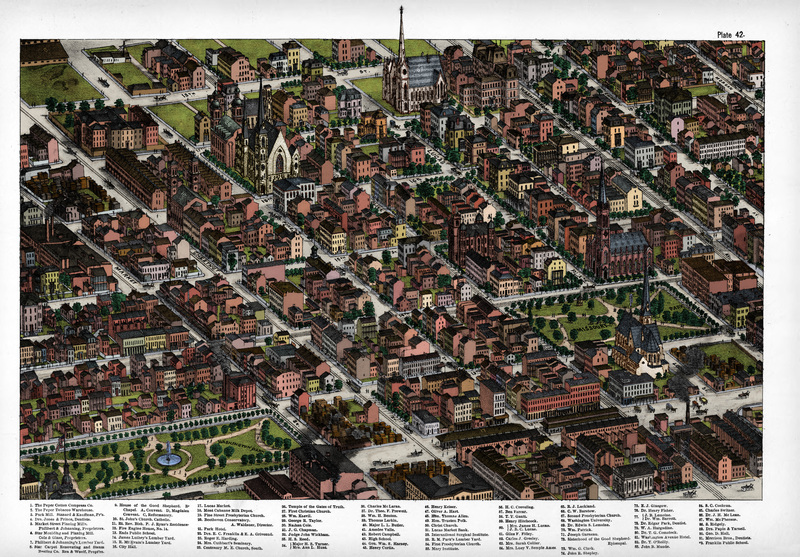 It’s still online at http://www.arcgis.com in a 3D viewer, just search for St. Louis 1875 Compton. This is great. Thanks for sharing! I tried a couple colorization neural networks to see if you totally wasted your time. They did not do well. Oh geez. You had me really worried for a minute there. Whew!